They were the innocent victims of a drunk driver in Sakon Nakhon. The accident took place on March 3. This trauma was a prelude to the deadly week of the Songkran festival, known as the “Seven Dangerous Days”, during which many families are likely to suffer similar losses. 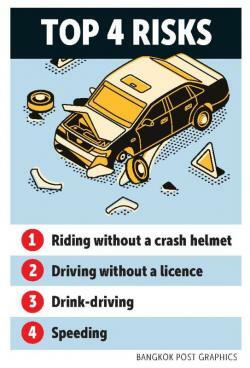 On the first day alone, April 11, 468 road accidents were reported, with 46 people killed and 482 others injured. In the early hours of the following day, a family of three was slammed into in their car by a drink-driver. A 16-year-old girl lost her parents in the accident in western Bangkok while she herself was left unconscious with severe injuries. The government has for many years spearheaded a road safety campaign to curb the high number of casualties during the New Year and Songkran festivals but with little success. This year, however, authorities threatened a harsher legal approach during the five-day vacation (April 12-16) – not just treating law violators as careless drivers but also murderers. The death toll of 418 during the last Songkran festival, the highest in a decade, was seen as the last straw by authorities. A committee meeting on measures to reduce these preventable fatalities, chaired by Deputy Prime Minister Prawit Wongsuwon, resolved to authorise police to charge drink-drivers with attempted murder if they kill people in car accidents, Defence Ministry spokesman Lt Gen Kongcheep Tantravanich said. He stressed a need to impose more severe penalties as many drivers remain happy to ignore traffic laws and continue with their rogue driving at this time of year. In some fatal cases, suspects have simply negotiated a settlement with victims’ families. “It seems that many Thai people don’t care about safety issues. 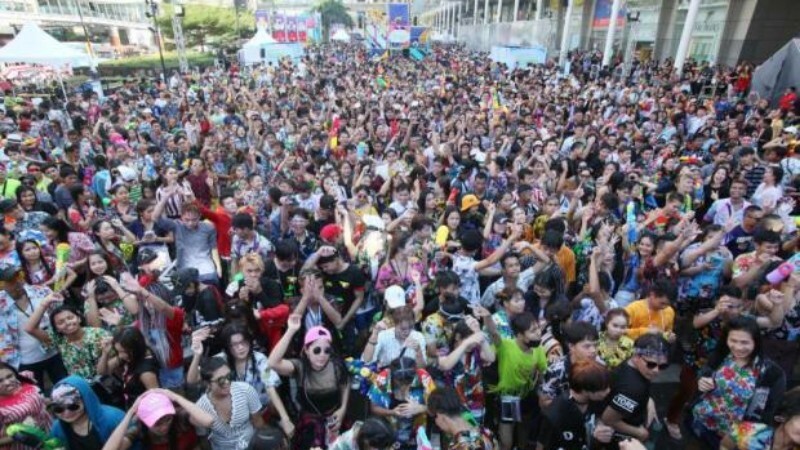 They’re still stuck in their familiar [unsafe] habits,” Gen Kongcheep said, adding that even a ban on Songkran revellers splashing water from the rear of pickup trucks became a controversial issue. The government wants to put a stop to risky driving behaviour, but it may be useless if it only focuses on setting new targets for fewer deaths during Songkran. Among new efforts is enforcing harsher penalties on those who violate the law, he said. The Royal Thai Police sent a memorandum to police nationwide on April 3, telling the officers to press premeditated murder charges against drink-drivers whose accidents result in death. “They may have no direct intention, but an indirect intention may remain,” the statement read. An accident at 11:30pm on April 11 when a drink-driver rammed his Mercedes-Benz into a Suzuki Swift, killing the parents of a 16-year-old girl, is an example of such indirect intention, say police. That day Sala Daeng police arrested businessman Somchai Werotphiphat and charged him with premeditated murder after he was found to have consumed five bottles of beer before driving and admitted to feeling drunk. Deputy national police chief Wirachai Songmetta said on Friday the 57-year-old’s behaviour showed he “knew” he could not drive carefully. He should have been aware that he risked causing a fatal accident. Instead of just asking the court to consider an offence based on careless driving, police have also asked the judge to consider the more serious charge. Echoing Pol Gen Wirachai, Don't Drive Drunk Foundation secretary-general Tairjing Siriphanich said the drunken man should have known to avoid driving. This precaution is a road safety issue “having been talked about and frequently been the subject of public awareness campaigns,” he said. Under Section 288 of the Criminal Code, a person convicted of premeditated murder could be subject to a death or life sentence, or between 15 and 20 years behind bars. Dr Tairjing, who suggested the Prawit committee adopt this harsh legal approach, said the measure is needed to frighten unlawful drivers. The main reason that the death toll has remained so high during Songkran is that people are not afraid of the penalties, he argued. According to Dr Tairjing, if wrongdoers are arrested and only charged with drink-driving, some may find ways to escape prosecution because of the connections they have. And if their cases do reach court, they are only fined between B5,000 and B20,000 and given a suspended jail term. For first-time offenders, the fine might only be B2,500, he said. “Many Thai people don’t fear the old punishments, so we have to make them fall in line by enforcing the law strictly and sentencing them to prison,” Dr Tairjing said. However, this does not mean all drink-drivers will face attempted or premeditated murder charges as their actions will be considered on a case-by-case basis, deputy national police spokesman Pol Col Kritsana Pattanacharoen said. In the memorandum, police are urged to thoroughly gather evidence before deciding whether to proceed with the more serious charges. “There are many factors that must be taken into account. It is possible some death cases are caused by careless driving,” Col Kritsana said. Pornpimol Muangsiri, the 34-year-old relative now taking care of the two-year-old boy who survived the fatal car crash on March 3, agrees with more severe penalties for drink-drivers. “Had I never suffered from the consequences of drink-driving, I wouldn’t have come to feel this way. I would have just thought the drivers were careless. Nowadays I can’t accept it [drunk driving] at all,” she said. According to Dr Tairjing, the drink-driver in this case was found to have the blood alcohol content of 251mg/dl. Another drunk driving victim, Phimpawi Somyanusorn, 48, also agreed with the stronger measures being implemented by authorities. Ms Phimpawi, who was formerly a private company employee, has spent the past 19 years paralysed from her shoulders down. In early 2000, she accepted a ride home offered by a drunk colleague after a company party. The car crashed on a bridge on the Bang Na-Trat road and flipped over seven or eight times. Ms Phimpawi broke her neck in the crash and her life hasn’t been the same since. Once enforced, harsher penalties will scare people from driving under the influence of alcohol, and, perhaps, she said, “no more people will be left handicapped or dead from such accidents”. The government has been unhappy to see Thailand feature so high in global rankings of the least safe countries to drive in over the last few years. From 2015 to 2017, the World Health Organisation (WHO) ranked Thailand second in terms of deaths from road accidents. Up to 24,326 people were killed during the period. Though last year, the country fell to the ninth, according to the WHO, it was still the least safe country in Asia. These accidents cost the country over 540 billion baht between 2011 and 2013, which accounted for 6% of the country's GDP, according to the Thailand Development Research Institute. In addition, a third of the Public Health Ministry's budget was spent taking care of those injured of left disabled by road accidents. However, with the new, stronger legal measures, authorities hope this Songkran festival will be the start of a journey towards safer roads.